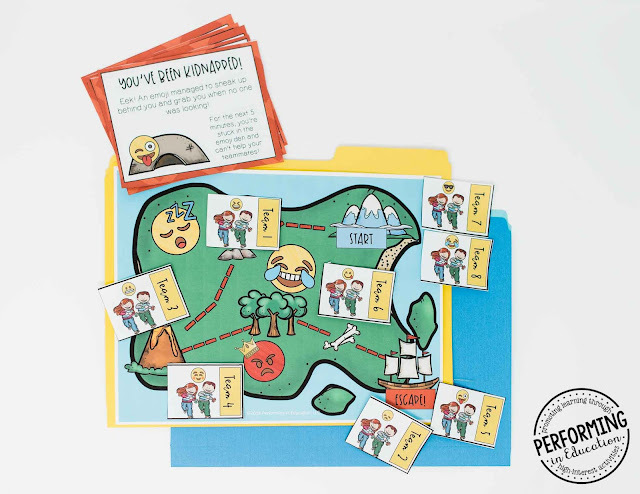 I'm always looking for new, fun ways to have students learn and practice our standards. 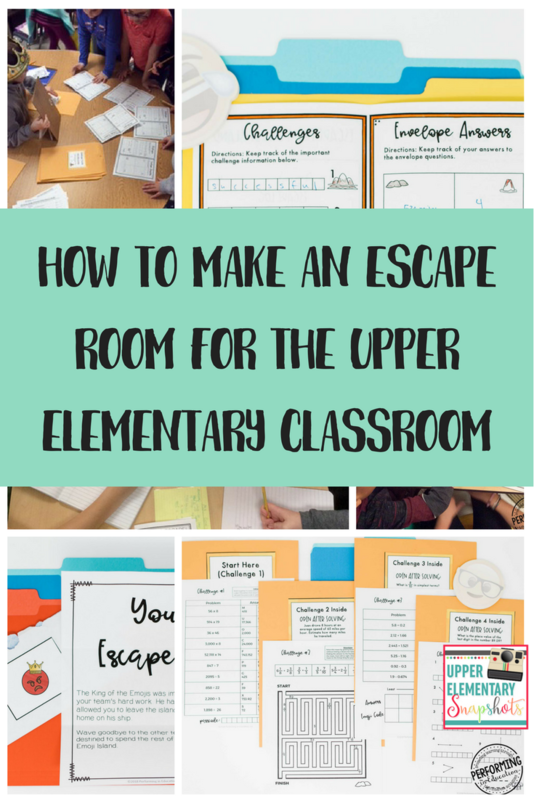 This year, the rise in popularity of escape rooms and escape classrooms really inspired me to figure out how they actually work in the elementary classroom. 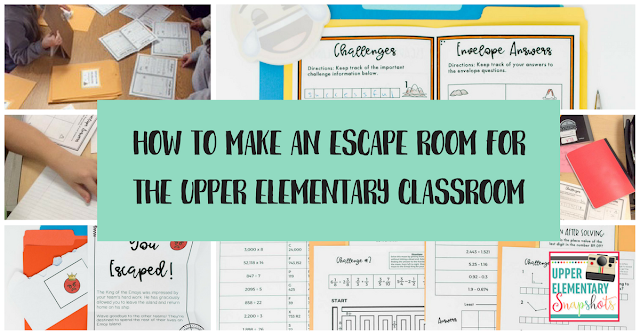 This post will help you get some ideas on how to make an escape room challenge for your 3-5 students! Looking for classroom photos of my escape rooms in action? Click here for my Escape Room Tips & Tricks blog post. 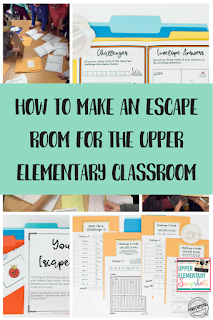 Something that you really have to think about when designing an escape room for the classroom is what theme would be appropriate and fun for elementary kids. Think about what your students are really into. Is there a mystery book series they really love that you can model an escape challenge after? I chose Emojis as the theme of my escape challenge. I'm not sure about you, but I'm not super excited about 30 kids running around the classroom looking for one clue. The way an escape room traditionally works (with one team), just won't work for a larger classroom. My solution is to use multiple teams, but change up the way they access clues. I knew teams were the way to go, but I had to think really long and hard about how to make this work. If one team finds a clue, then the others are obviously going to see it before they even solve the puzzle. I had to consider all of the different ways that kids could get by without doing the work to pass the challenges. I put all of my challenge envelopes in one place. 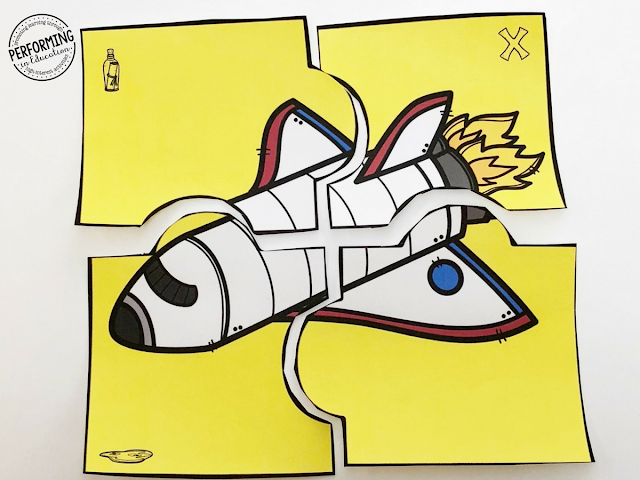 In order to get from envelope to envelope, they have to solve puzzles by answering questions that are standard-aligned. They even have to answer an additional question to even be able to open the envelope. In my escape challenges, only one team escapes. It's a race to be that team. I even have badges for the team that escapes first to wear after. You have to figure out a way where students won't share the answers or locations of the clues. My last clue is the only one that leads to an envelope they find - because once a team finds this clue, the game is over and the rest of the teams did not escape! There are many different ways to make activities for an escape challenge. I recommend making 4-5 challenges, with small mini-challenges in between. I always put my mini-challenges on the outside of the envelopes, so that they have to do one more reading or math problem in order to even open the envelope. One way to motivate students is to show where all of the teams are throughout the challenge. I use a map to do this. Each spot on the map corresponds with the envelope they're on. In some of my games, I have students collect puzzle pieces. Completing their puzzle first means they're the first to escape. Making a cipher wheel is simple, and you can easily find one to print online. The outer circle has capital letters, and the inner circle has lowercase letters. This makes it easier to align the letters without confusion. The wheel starts as A = a. An encryption key is needed to tell students the number of places they rotate the outer wheel. The place where the outer wheel lands is the key. In the example below, students solve math problems to determine how many times to rotate the outer wheel clockwise. Where the wheel lands gives them the letters they need to decrypt the code on the top of the page. I give them a table so that they can write the corresponding lowercase letters in, making it easier to substitute when they tackle the code. A simple substitution code using a font is really easy to make, but it looks like you came up with a seriously cool code that they have to crack. 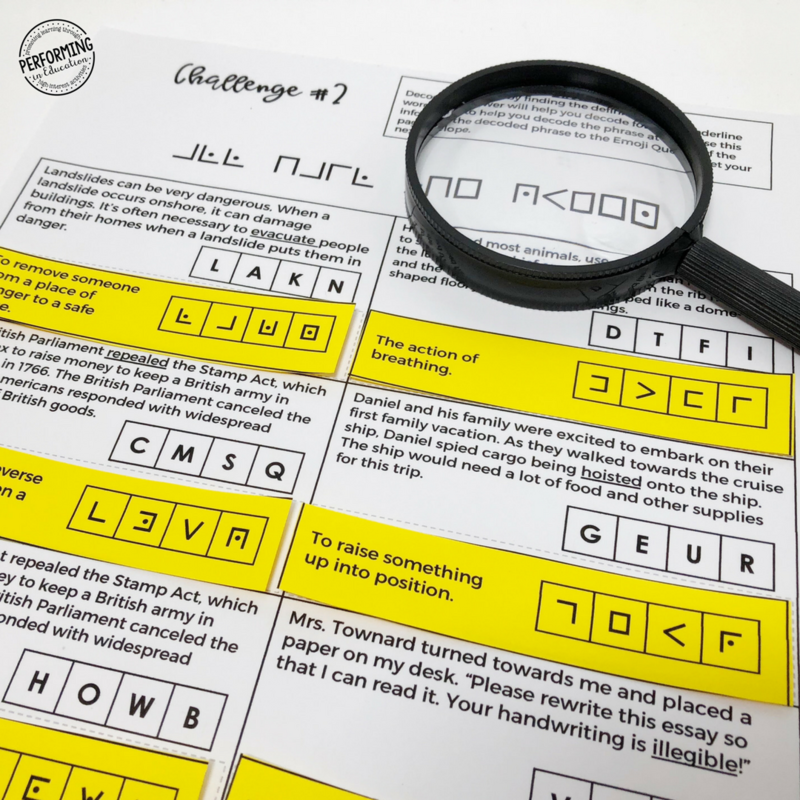 All you have to do is write the letters out, then change them to a code font like the Pigpen Cipher Font. There are a lot of fun runic fonts to choose from as well. That's 6 envelopes total for the entire escape challenge. I make a copy of each challenge for each group and put them all in the same folder. Also, I don't include too much that needs to be cut. I limit this to one activity per challenge that involves cutting. Even with students to help, you don't need that many pieces to keep track of. A big concern I had about escape rooms in the classroom was participation. It's so important to think ahead and plan what you're going to do if certain students really take over your challenge. It will happen with your high-fliers. They know the content well and the competitiveness of racing to escape first will drive them to do all of the work while their team watches. Have students split the work for each challenge. That means that each challenge should have a number of questions that is more than how many kids are in the group. Find a creative way to take students out of the game if you need to. I use "You've Been Kidnapped" cards that I give to students who are taking over the team and not letting others participate, or to disrupt a team that is racing past the other teams. They have to sit out in the "Emoji Den" for 5 minutes when I give them this card. Lastly, have a place where all students can write answers and the codes. Make sure to check these as they go to make sure they are using them. I designed mine as a booklet where they keep track of the emoji codes and the answers to the quick questions on the envelope. Not quite ready to create your own? Click here to find all of the classroom escape challenge I've made.